If you like improvisation, and the community that is building up in the UK and Ireland, there are a lot of ways to support it. I know because I asked the community and they offered a load of amazing ideas! In the spirit of improv, I’ve melded the ideas together into a single piece, and listed contributors at the bottom. (The original conversation can be found here). Talk to each other. Ask a question or contribute to a discussion online, most obviously in the UK Improv Network group on Facebook. Develop the map. Add some groups to the Suggestible’s improv map of the world. Leave a review. For an improviser’s book, for a show you went to, or a venue that’s doing good work. Write an article. Doable directly on a social media site, or it’s trivial to start a free blog and get some ideas up there. Or reach out to someone with a platform. The one that comes to mind for me is https://thephoenixremix.com/ which has the aim of making people aware of improv groups they haven’t heard of yet. Plus it also publishes accounts of how performers got into improv, which is a great way to directly present how accessible and valuable it can be. Write up an exercise, game or format. Share work that you’ve developed and start discussion. Do an interview. There are plenty of amazing podcasts out there, find out if they are looking for contributors and share what you have to share! Go to jams. Or any other night where inexperienced people are on the stage. It’s great for these nights to have a mix of ability levels, and unlike, say, tennis, you can be stretched a lot by playing with people who lack experience. A monthly jam is your monthly community meeting, to go and see people, meet newcomers, be a beacon for new improvisers in your town. So support it. Invite new people out. Fresh faces exposed to improvisation raise the chance someone will fall in love with the artform, and they might end up being the one who changes it altogether. If you invite people who are underrepresented in the art-form – older, non-white – there’s an even greater chance of a fertile outcome. Speak to singletons. If you go to an improv jam/show and you see someone on their own speak to them. People are more likely to return/spread the word of improv if they not only have fun but really feel included. Celebrate the scene. When you are at festivals abroad or talking to visiting international teachers, talk about the good work that’s going on, often untrumpeted, within our community. Let people know! Reinforce the behaviours you want to see. Thank people for running a night that is community focused, or for trying something ambitious on stage. Confront mean-spirited behaviour, after the fact when appropriate, or in the moment if necessary. Stoke interest. If the area where you live is a deadspot for improv then you could post in groups that might be interested – comedy, music, actors, etc. You can also use groups that are based on your locality – a neighbourhood or commmunity group. Start a jam night. See above for how great jam nights are for the scene. If there isn’t one locally, have a read of this blog post for how to launch one yourself. Invite guest groups. This a great way to open up globally, and doing that really helps a local scene so it grows and doesn’t become too incestuous. Example nights that make this a focus are Different Voices in Leicester run by the Same Faces and [our night] Let Us Make It Up To You in Newcastle. All the better if you can champion acts that are underrepresented in your area and aren’t visible on your stages. Charge a fair price for improv shows. You can take this either way: if you feel the nights in your area are out of access to some people, put on a pay-what you want night to cater to that audience. It’s perhaps more common that shows are free or budget-priced, making it difficult to pay performers. Then consider whether it’s time for a show at a higher price point, sending a message that quality improvisation deserves the same investment as comparable nights of live entertainment. Upping Your Group (duo, solo) Game. Invite a guest in. This could be someone from another local group, strengthening ties and reducing the competition mindset (see below), or out-of-towners, which forges wider links. For the latter, consider and talk to the visitor about logistics and what compensation is reasonable for them coming to you. Try new things. Project Two have been great for ages but this year they decided to step it up with Thirteen Cycles, raising the stagecraft, tech and scenography approaches to a whole new level. And it’s daring to see genre work that isn’t scaffolded to household names – like the Caryl Churchill-infused format being developed at The Nursery. Schedule group meetings. There is a ton of ways to improve your group’s batting average, longevity, and joy, and they are likely to be apparent to you if you sit down with the other members regularly to review what’s working, what’s not, and what people want for the future. Take your group to another city. This is the complement to inviting guests; this way you do a bit more of the legwork but you get the benefit of a mind-expanding trip, and get to learn how other people run a show. There is a lovely, effortless to and fro between being a guest and being a host – once you start making these links, they quickly cohere into something indispensible. Scratch backs, don’t bite them. If you do something a little differently from elsewhere, try and consider that as adding more flavours to the community. Critique and discernment can be useful in its place, but throwing shade only exacerbates difference. Go see and support shows/events/etc from the other companies near you! Any improv show/jam/event/whatever is good for the whole community – cos people who’ve been to one improv thing, generally see more improv. It’s them ones who’ve not seen it we oughta worry about converting. Plan to avoid clashes. This is difficult in very busy scenes like London but otherwise bear in mind, or think about a way that those two events can collaborate in a way that’ll work better for both parties. Help out with an existing project. The British Improv Project. Now in it’s fourth year, this is a co-op non-profit group that runs gathering weekends twice a year (currently) attended by up to 60 people each time from improv groups across the UK. The next one is 12-14 April. Spreading the word and coming along are the main ways to support but if you have any ideas, get in touch with them! Hoopla’s UK and Ireland Improv Festival. A festival that explicitly aims at promoting the UK and Irish improv community. The main way to get involved would be to apply, but also to come and watch and support it! UK student improv festival This is also running for the first time in 2019 – more details here. Again, applying and taking part are huge ways to make these ventures succeed. Make a listings. Midlands improv has a monthly gig guide. Does anywhere else do this? If not, you could. Or how about a UK improv wiki, with shows tagged by style and tone? Helping two groups in different locations discover they are both doing fantasy genre improv, and exchange ideas and end up doing a cool collab. Create a community project. It’s up to us to find ways to extend our work and joy to groups that are under-served. That could involve finding a community group that would be interested and offering your skills there. Finding funding may be part of the picture, as it reduces financial hurdles. And you could be speaking to institutions (eg local colleges) about the prospect of accrediting courses as an incentive to help attract people to something new and strange (and ultimately wonderful). Start a research project. E.g. collecting people’s experiences with improv as therapy in whatever form that may take. Establishing a marketing “best practice” group. This is a place where people from different improv groups can share techniques, messaging and campaigns that have worked / not worked for them. This can be info on marketing shows, courses, drop-ins along with sharing wider marketing advice, knowledge and articles. Cultivate a safe, transparent, and welcoming community. Call out problematic behaviour. Whether in the green room, post-festival bars, onstage or online, stand against harassment, mistreatment and cruelty. By the same token, keep the community honest. If you see untrue claims being put forward (the longest-running x, the only people doing y), point out or remind those responsible of the facts. It’s inevitable that marketing contains a little sizzle, but it doesn’t need to erase or denigrate others. Believe in ourselves more. The UK scene has the world’s longest running improv show (Comedy Store Players) and started Whose Line which took improv into the mainstream. Keith Johnstone came from England, and we have inherited a rich theatrical tradition populated with leviathans. 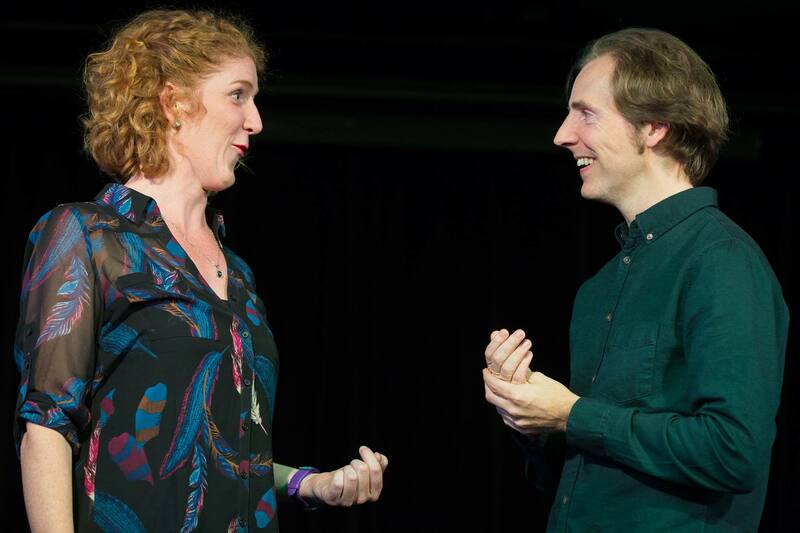 We have some of the most successful improv shows worldwide (Showstoppers, Austentatious, Comedy Store Players) as well as improv groups that have broken out into other theatre (The Mischief in the west end and broadway). We have developed a glorious melting pot of styles, thanks to our own traditions and the benefits of being geographically near to European community and linguistically near to improv centers hundreds or thousands of miles away. Let’s keep being brave and experimental and non-exclusive. How to start? Find something that resonates, and identify the first action to do. If it can only be done at a certain time or place, put it in your calendar. Once you begin, you’ve drawn something from the imagination into the real, just like a clear initiation in a scene. The rest, as you know, is just building from there. Speaking of improvisation analogies, find a partner or team with whom to do it! Make a public commitment! Here or on Facebook or wherever. It’s a good way to light a fire under yourself. Don’t say too much, or you’ll be reaping the feel-good rewards of achieving something before putting in the slog of doing it. Just put your hand up and then get going. Why just UK and Ireland? Hey, definitely do some international collaboration – I’m a proud member of European network Ohana and part of the team for a German festival. International is great. But it’s a good principle to plant where you stand, and make things that can still thrive beyond the era of budget airlines. Make your neighbourhood your own improv mecca! A quick primer on improvised storytelling.